Did you know that Torcan specializes in Custom Colour Matching? We can custom formulate our stain colours to meet your needs. Torcan Coatings Inc. is a proud to be a distributor for the full range of Amorim Acousticork Sound Control Underlayment and Crack Suppression Membranes. Acousticork Products are recognized in the building industry as some of the most effective sound control and crack suppression underlayments used under had surface floors. Residential and commercial high-rise complexes such as condominiums, hotels and motels throughout the United States, Canada and Europe have used Acousticork products to reduce unwanted noise. 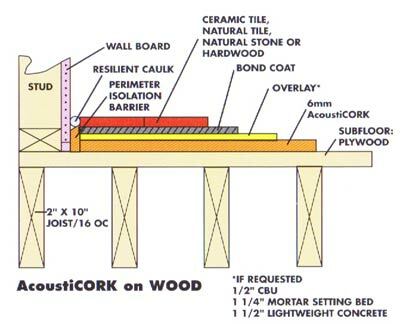 Acousticork Products are designed to meet building codes and condominium association requirements for floor/ceiling assemblies using ceramic tile, marble, stone or hardwood floors. Acousticork Products have been tested in accordance to ATSM standards for acoustical values at Riverbank Acoustical Laboratories, an independent laboratory accredited by the National Bureau of Standards of the U.S. Dept of Commerce, NVLAP. Part of the natural attraction of Acousticork Products is the working ability to install the product and immediately move on to the next installation step with no waiting time. With Acousticork Products you are guaranteed consistent thickness of the sound control underlayment without trowel leveling of products that are mixed on site. The consistent thickness ensures a quality sound rated floor system. Incorrect. Think of the most common use for cork, wine stoppers. Cork has been used for wine stoppers for hundreds of year primarily because it does not absorb water or liquids. Cork has also been used for years in buoys, lifejackets and other floatation devices, again because it does not absorb water and can remain buoyant for years. A cubic inch of solid cork immersed in water for 48 hours will gain less than 3% in weight due to water absorption. A cubic inch of solid wood or unglazed clay-bodied ceramic tile would gain many more times this percentage in weight of water if immersed for 48 hours. Incorrect. That may have been the case over 20 years ago when animal protein binders were used, but not anymore. Since the early 1980’s non-water-soluble polyurethane binders have been used to adhere the granules together to make Amorim composition cork products. These polyurethane binders also produce no post installation off gassing and do not leech into ground water supplies. AcoustiCORK™ products can be totally immersed in water for 30 days or more and show no signs of structural deterioration. Incorrect. Because cork absorbs so little water, it is very dimensionally stable. When exposed to 100% Relative Humidity conditions for 30 days the dimensional change in the grade of materials used to manufacture AcoustiCORK™ products is less than 3%. In a 6mm thick piece of material this would represent an increase in thickness of less than 1/120 of an inch. Cork will compress and crumble under heavy loads and traffic. Incorrect. Unlike open or even close- celled synthetic foam materials, cork consists of an interlocking structure of 14- sided polygons called tetracadecahedrons. These totally sealed gas filled cells have a very tough outer surface that is almost impossible to break. Because of this unique natural attribute, cork has a compression/recovery rating of close to 100%. Unlike many foam and fiber based products, it will not collapse over time with traffic. The binders used to adhere the granules of AcoustiCORK™ products together are designed to create a permanent structural bond between the particles. Cork will support the growth of mold and mildew if used in a moist environment. Incorrect. Going back to the traditional use of Cork in wine stoppers, solid Cork is used for sealing fine vintage wines precisely because it does not readily support the growth of molds and other biological agents that can cause spoiling of the wine. Additionally, the granules of Cork used to make AcoustiCORK™ products are coated with a polyurethane binder, which enhances their natural microbial resistance. Incorrect. Properties such as density, particle size and consistency of particle size are very important and vary widely from one manufacturer to another. Density affects the structural stability of the product and the sound attenuation quality. A product that lacks density will be too delicate to use as an underlayment and a product that is too dense will have poor sound attenuation characteristics. A product that has too large of particle size or a wide range of particle sizes in the mix will lack the structural integrity to be effectively used as an underlayment. Copyright 2007 © Torcan Coatings. Designed and Hosted by Latest Developments Inc.